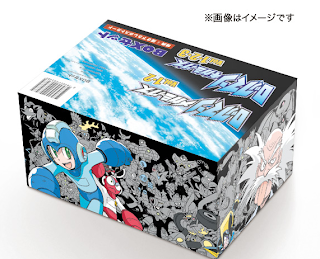 Japanese retailer Tanomi have begun accepting pre-orders for "Rockman Megamix & Gigamix BOX", which, as the name implies, is a hefty boxed set of Hitoshi Ariga's Rockman Megamix and Rockman Gigamix manga series. Inside the gorgeous packaging, you'll find five books: all three Megamix volumes and volumes 1 and 2 of Rockman Gigamix; Rockman Gigamix 3, however, is inexplicably absent. Also inside, a nice little bonus: a postcard featuring more, exclusive art from Ariga. The boxed set is being released to celebrate the conclusion of Ariga's "Mix" series, which came to an end early last month with release of Rockman Gigamix 3. Pricing and a release date have yet to be revealed but those details should surface within the coming weeks. Yes, this is Japanese exclusive. Maybe if Udon gets around to Gigamix, we'll have something similar in the future. UPDATE: Additional info via The Mega Man Network -- The set will release in early January, retailing for $82.78 US; there ARE three volumes of Gigamix; all three Megamix volumes have been condensed into two books. That artwork is fantastic. I love Ariga's renditions of the MegaMan characters (then again, who doesn't?). Yeah they shoved the old Megamix 1 and 2 into the new Megamix 1. I still have yet to scan them in. A pity it doesn't include Gigamix 3 too, but it's great nonetheless. I'd wish I could gain it in xmas. btw, Merry Christmas Protodude and everyone else. Hey anon, they are included Gigamix 3 in this, all of the books are in this box.